A low rate credit card makes large balances a little more manageable. If you carry a balance from one month to another, a low interest credit card could be a good choice for you. 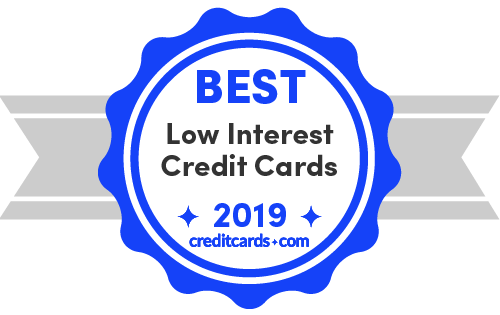 Browse the best low interest credit card offers from our partners and compare introductory rates, ongoing rates, annual fees, and rewards to find the right card for you. With the average credit card APR climbing to an all-time high of 17.67%, low interest credit cards can save you hundreds of dollars in 2019 while paying down debt. Although it's usually best to pay off the balance each month, sometimes that isn't possible. That's where low interest cards come in. What's the difference between interest and APR? What is the average interest rate on a credit card? How does your credit score affect your interest rates? Wondering if you qualify? Want to understand how your score affects your interest rates? We look at that and more. In addition to excellent rewards (5% back on rotating categories up to the quarterly maximum each time you activate, plus double your cash back at the end of your first year), this card offers 0% intro APR for 14 months on both balance transfers and purchases. The regular APR is 14.24% - 25.24% variable. What we like about this card: The low regular rate of this card gives it oomph when it comes to paying down debt. Add to that the BT and purchase introductory APRs, and it's a card you'll love. This card's reliable rewards of 3% cash back on all first-year purchases up to $20,000 spent – and 1.5% cash back on all subsequent purchases – make it a favorite among cash back cards. What we like about this card: While the regular APR isn't the lowest at 17.24% - 25.99% variable, the 0% intro APR offer is solid at 15 months on both purchases and balance transfers. In addition to a $150 sign-up bonus after spending $500 within the first 3 months, there's the 1.5% back on all eligible purchases. What we like about this card: If you are looking for a card to travel with that will earn you cash rewards and you want the ability to defer interest on purchases and balance transfers (15 months, 0% intro APR), this is a good choice. The regular variable APR is 16.24% - 26.24%. The Citi Simplicity Card features one of the best introductory offers out there, with 21 months of 0 interest for balance transfers and 12 months interest-free for purchases. Afterwards, the regular APR is 16.24% - 26.24% variable. It also boasts no annual fee, no penalty APR, and no late fee. Unfortunately, the balance transfer fee is quite high at 5% of the amount of each transfer, with a minimum of $5. What we like about this card: An excellent choice for those with good credit, the Citi Simplicity has a very long 0% APR period. While this card has no 0% intro APR on balance transfers, and only 12 months on purchases, its ongoing APR is worth looking at, at 14.24% - 24.24% variable. Also, this card offers a sign-up bonus of 20,000 miles after a $1,000 spend within the first 3 months of card membership and 1.25X miles on all eligible purchases. What we like about this card: This card's regular APR is one of the lowest among major cards, making it a good choice for attacking your balance. We recommend this card for its long 0% intro APR period of 18 months on purchases and balance transfers. Unfortunately, the Wells Fargo Platinum's regular APR of 17.74% - 27.24% begins above the national average. Also keep in mind that balance transfers must be made within the first 120 days in order to qualify for the introductory APR offer. What we like about this card – This card's long intro offer makes it a solid choice despite a steep regular APR. This credit card is very straightforward. It doesn't have any rewards or bells and whistles, but it is designed specifically for people looking to minimize interest payments. Both purchases and balance transfers get an intro 0% APR for 18 billing cycles, then 15.24% - 25.24% variable. Balance transfers must be made in the first 60 days in order to qualify for this intro offer. There's no annual fee and no penalty APR. As a handy benefit, the BankAmericard gives you access to your FICO credit score for free. What we like about this card: This card recognizes that it has one job, and does that job well. This card carries a low regular APR of 14.74% - 25.74% variable. Its 0% APR intro offer stands at a very long 20 billing cycles on purchases and balance transfers, meaning you pay 0% well into 2020. What we like about this card: This card has some of the lowest interest rates available while also carrying one of the best balance transfer offers. The Discover it Balance Transfer offers a bit of a twist with a cash back match at the end of your first year. You can earn 5% back on select rotating categories each quarter after enrollment (up to $1,500 in combined purchases, then 1%), and Discover will match the cash back you've earned at the end of your first year. Also, get 0% intro APR for 6 months on purchases and for 18 months on balance transfers. It's 14.24%-25.24% variable after that. What we like about this card: This is a great card for maximizing your rewards on everyday spending, such as gas stations, groceries, shopping at Amazon.com and at restaurants. The Propel's primary purpose is as a rewards card, where it excels with its 3X points per dollar spent on travel purchases and sign-up bonus of 30,000 points for spending $3,000 on purchases in your first 3 months. It has a regular APR of 16.24% - 27.24% variable. The lower end of this interest range is below average; unfortunately the upper end of 27.24% is quite high. What we like about this card: If your credit can land you on the lower end of its variable APR range, the Propel can be a viable low interest card. While the terms "interest rate" and "APR" are often used interchangeably, they can be different according to the lending product. For credit cards, the terms "APR" and "interest" are synonymous. Interest simply reflects the annual cost of borrowing the principal balance on a loan, says Discover. Meanwhile, APR, which stands for annual percentage rate, often includes fees charged in association with the loan and is designed to reflect the total cost of the loan over time, says Discover. Retail cards are among the highest in interest rates, although they have advantages such as loyalty rewards and they will often require lower credit. Retail cards had an average rate of 25.64% in late 2018, according to a CreditCards.com poll. Store-only cards' rates were even higher, at almost 27.23%, while co-branded cards were at 23.06%. A co-branded card is typically a card within one of 3 major card networks (Visa, Mastercard, American Express) that also carries the store's logo. But it's the rewards programs that make retail cards competitive. What counts as a low interest rate? What makes a low interest rate is relative. If you are looking at car loans or mortgages, you might shoot for something below 5% and even lower. With credit cards? A low interest rate below 10% is rare and something to treasure. Low-rate credit cards typically charge an APR more than 3 percentage points lower than the national average for all cards. The Discover it Cash Back, for example, offers a starting variable APR more than 3 percentage points below the national average. That said, to qualify for such a low rate, you'll need to have excellent credit and other good credit habits. Credit unions are a good place to look for low interest cards. You'll have to become a member, however, and you'll have to meet credit score and income requirements. Even then, there's no guarantee. There are a number of tools in your tool chest – low interest cards, 0% intro APR offers and paying in full each month. By thinking strategically about how you plan to spend and pay, you can minimize your interest charges, build your credit and enjoy the convenience of a credit card. Even though there are low interest rates to be had, consumers in the U.S. are woefully unaware of the APRs they do have. In a recent poll by creditcards.com, it was found that 48% of cardholders aren't so sure about the interest rates on their cards, Gen Xers carried a balance on more cards and consumers over 55 were more likely to not carry a balance. The higher your credit score, the better your interest rate can be, depending on the product. This goes for both credit cards and installment loans such as mortgages and car loans. Some cards offer a range -- your credit score, payment habits and balance can affect the interest rate your receive. In the case of installment loans, Forbes compares two neighbors, each with a refinance of $300,000 with a 30-year fixed mortgage. The difference is one has a 750 credit score, while the other has a score of 620. Because of the score differences, the neighbor with the 750 score gets a 4.25% rate, paying $1,476 a month, while his neighbor gets a 4.75% interest rate, paying $1,565 a month. Forbes points out that by paying 2 points or $6,000, the neighbor with the lower score can get the lower rate, a rate that the neighbor with a 750 score received at no extra cost, all because of having a great score. In the same way, your higher credit score can get you a better APR on your card, typically from within a range. But how do you get a better credit score? If your credit isn't where it should be for landing a low interest card, make 2019 the year you improve your credit. Here are 7 ways to get your credit score where it needs to be. Pay on time. This is your most important part of your FICO credit score. Always pay on time. Pay in full. A part of the second most important aspect of your score, this is a habit that speeds up your chances of getting a better score. Get a credit card. The fastest and easiest way to improve your score is with a credit card. If you don't already have one, get a card you are reasonably sure you will be accepted for, checking your credit score and credit files first. Consider a small installment loan. This is tricky, because every time you take out a loan, your score gets dinged a little. But if you are careful about borrowing when you are reasonably sure you will get the loan, then it can actually help your score because scoring models like it when you have a variety of lending products. No new cards, please. Yes, having a credit card helps your score, but that doesn't mean the more the better. There is one thing you want to do when expanding your credit horizons – resist the urge to take out new cards until your score is where you want it to be. Be patient. Part of your score is based on length of credit history. That's why it's important to keep on plugging with your good credit habits. Ask. Once your score has improved, simply ask your card issuer for a better rate. Our research shows that when consumers ask for better rates, they have a shot for getting what they ask for. While you are quoted an APR, or annual percentage rate, your interest is calculated at the end of each day. To find out how much will be accrued each day, divide the APR by 365 days. Then, multiple that amount by the amount owed, and add that with the amount owed. For example, a $13,000 balance at a daily periodic rate of .02805 percent would add $3.6465 in finance or interest charges to your balance, making the next day of the billing cycle's balance $13,003.65. To calculate interest on a credit card, use our handy-dandy interest calculators, which allow you to figure out how long it will take you to pay off a balance with the minimum payment; how much you can save by speeding up the payment process; and more. APR for purchases. The most common APR, this rate is applied when you carry a balance. Some cards, such as The Amex EveryDay® Credit Card from American Express†, offer a 0% intro offer for a set time, in the case of the EveryDay, for 15 months. Then, the balance is charged at the go-to rate of 15.24% - 26.24% variable, which is usually the standard rate for the card. APR for balance transfers. Similar to the purchase APR, balance transfer cards will usually offer a 0% intro APR for a set amount of time, then revert to the go-to rate. Cash advance APR. This rate usually kicks in immediately after you take out the cash. Penalty APR. Some cards, such as Discover products, don't have this type of APR, while others do. It can be considerably high and some issuers reassess your payment history regularly to decide if this rate continues. A high interest rate is one of the biggest culprits in attaining card debt. If you owe $3,000 and you are paying a rate of 16.5% APR, then it would take you 124 months to pay the minimum amount, and you would end up paying $2,122 in interest alone. Surprisingly, card debt is approaching $1 trillion, reaching $844 billion in Q3 2018, according to the New York Fed, up by $15 billion compared to the previous quarter. Also, seriously delinquent accounts (more than 90 days past due) reached 4.9% that quarter, up from 4.8% the previous quarter. To avoid that debt, the best thing you can do is to pay in full each month. Also, avoid putting charges on your card that you can't pay in full by the due date. Want that big-screen TV but don't have the cash? Start setting aside the money rather than paying with your card without a plan. If you're already stuck in debt, you can avoid paying some interest by paying more than the minimum amount. Remember that $3,000 at a 16.5% rate, in which you end up with more than $2,000 in interest charges because you paid the minimum? Well, if you paid $200 a month, those interest charges would drop to $383. Another way to save money on interest is to transfer an existing balance to a balance transfer card or a low interest card. With a lower interest rate, and even better, 0% intro APR, you can pay off that card debt at a faster rate. Also, you save hundreds of dollars in interest charges. As you can see, even when you are paying the minimum, with the same card but the lowest and highest interest rate offered, the difference in the amount paid in interest is considerable, with the lowest rate paying more than $3,000 less in interest charges than the highest rate. So, how do you get the lower interest rate? Card issuers look at a number of factors, including your credit score and your payment history, when deciding which rate to give you. Also, know that it's worth your while to simply ask for a rate decrease. A 2018 CreditCards.com poll found that 56% of consumers who asked for a rate decrease were given what they asked for. The stars may not be aligned for you when it comes to using a low interest card – you may not have the best credit or you already have a ton of cards. Well, we'll take you through a few scenarios and how to make that card work for you. You've landed your low interest credit card, but the limit you've been granted is too low to pay the charge you had planned for it. Here's what you do: Pay for the charge with 2 cards – the bulk goes on your new card and the rest goes on the card you have with the lowest interest. Then, pay off that card first, while budgeting to pay off the low interest card before any special offer ends. If your credit is too low to get a 0% or low interest card, which typically requires good or excellent credit, there's another way. Here's what you do: Have your spouse check his or her credit. If it's within the acceptable range, ask him/her to take out the card and make you an authorized user. Just make sure you have an agreement in place on how it will be used. You may have a big bill to pay, but you also want to get in on the rewards action. Here's what you do: Some rewards cards also have great introductory offers on balance transfers and purchases, such as the Bank of America Cash Rewards and the Capital One SavorOne. Take out one of these cards, and have your spouse take out the other, then make each other authorized users. Arrange to purchase gas and wholesale club purchases with the Bank of America card, then shop at grocery stores and restaurants with the SavorOne. Be sure to coordinate spending – one way is to look at your accounts every weekend to make sure you aren't going over the limits. Let's say you land a 0% card, but you can't pay it off before the offer ends. What to do? Here's what you do: Figure out the maximum you can pay each month then continue to pay that amount even after the offer ends. That way, you minimize how much interest you pay. Let's say you have more than enough cards, and you just need that new card to get you through a tough spot. Here's what you do: Once your debt has been paid off, you may be interested in closing the card's account. Consider the Citi cards with long 0% or balance transfer offers without rewards. That way, you aren't tempted to spend, and there are no regrets when you close the account. Even with the best intentions, we can incur thousands of dollars on our credit cards within months. Amongst those who don’t have a plan to tackle their credit card debt, 42% stated they simply don't know where to start. But it's not just the original expense that can impact your wallet – interest charges can actually run more than the original expense if you pay the minimum amount due each month. And there's another reason why you should avoid keeping a balance on your card. The second most important factor of your credit score is your credit utilization ratio, or how much you owe on your cards compared to how much credit you have available. So, if you owe $500 and you have $5,000 in available credit, then your utilization ratio is 10%. As you can see, there is a ratio for each card and a total ratio for all cards combined. Both matter. The industry standard is to keep the ratios under 30%, but it's best to keep them as close to 0% as possible, partly to avoid paying interest and partly to keep your credit healthy. How do you avoid card debt? Carrying a balance does a double whammy on you – first, you owe not only for the charges you've made, but also any interest accrued each month you carry a balance. Then, when you have a high balance, that can affect your credit's health – credit score models want you to have low debt compared to your available credit. Create a dual budget. Make a budget for all expenses, then create a column just for credit cards and a column for withdrawals from your checking account. Include everything, so that you don't come up short the next month. Save. As you can see below, room has been made for savings. This isn't for a last-minute road trip – rather, this is for when your car breaks down or some other emergency occurs. Check back each month. Check your budget each month to make sure you are on target. Adjust to ensure your budget is realistic. Set a reminder. Create a reminder to pay the card bill before the due date. There's no point in having the money to pay the bill when you don't remember to pay it! Enter the 21st century. There are a number of apps out there that can help you manage your finances, including YNAB (You Need a Budget) and Mint. Each differs in its approach, but it's a fair bet there's one that suits your style. Some, such as YNAB, sync with your bank, and most, such as Mint, help you track and pay your bills. Set aside savings. If you don't have the money for an item you want, set aside savings. Even setting aside $200 a month will give you almost $2,500 at the end of your first year. Just make sure you are also setting aside money for emergencies. Many financial institutions will allow you to create subaccounts that you can use for putting money aside. How do I pay off my credit card balance? Maybe you've already incurred debt on your credit card. What to do? Make a budget. First things first: Create a budget with room for saving and fun. That way, you don't have such an austere plan that you give up in frustration. Calculate the interest. Based on your balance, figure out how much interest you will be paying. Figure out how much you can pay each month. Now that you know how much interest you will be paying, figure out how many months it will take you to pay the balance off, with your trusty budget in hand. Transfer the balance. Consider using a balance transfer card, which will allow you to pay 0% or low interest for a limited time. Stop spending. Resist the urge to keep spending on your card; that will only get you deeper into trouble. Keep the card. After you pay off the balance, hang on to your card, putting a small charge on it each month and paying in full by each due date. This helps with keeping your credit healthy by having a higher available credit. Low interest credit cards are about more than just the APR. You'll want to also factor in the different types of APRs, the annual fee and more. As you can see, the cards' lowest rates and annual fees are comparable, while the cash advance rate is lower for the VentureOne. If you plan to pay off your balance, the rewards for either card can also be worth your while. Who are low interest credit cards good for? Whether you are carrying a balance or planning to get rid of one, a low interest credit card can be a good choice. Here are the people who might benefit from a low interest credit card. Good credit. Typically, the better your credit, the better your interest rate on a credit card, although there are other factors a card issuer also looks at. Carry a balance. Although carrying a balance on a credit card isn't ideal, if you must, a low interest card may be the best choice. Great habits. If you are in the habit of paying on time each month more than the minimum, that will speed up your ability to pay off the balance. Workable plan. Yes, you have a balance, but that doesn't mean you will always have one. Figure out how much you can afford to pay each month, stop incurring new debt, and keep your sights on the end goal. You can read some individual reviews for low interest credit cards at our reviews section. You can use these to get a better idea of how products compare to one another and decide which offer is the best for your needs.